For several years now, I’ve run the site rehearsaltracks.net to privately host rehearsal tracks for choral groups that I participate in. With the holidays fast approaching — and with them the inevitable Messiah sing-a-longs — I figured it was finally time to share something more broadly useful: a set of Messiah rehearsal tracks. All part numbers, measure numbers, and page numbers are based on the Bärenreiter Urtext edition of Messiah, but I expect that they should line up pretty well with most other editions. For “How beautiful are the feet of Him/Their sound is gone out,” the version presented here is the second version (34a/35a) instead of the longer versions (34/35) that appear earlier in the edition. For “O death where is thy sting?” (44) the cut from measure 5 to measure 23 is removed. Feel free to give them a try! And if you find any errors, be sure to click the “Report an Error” button to file a report, and I’ll be sure to get it fixed as soon as I can. September is finally here, and with it, the start of a new choral season. I recall when I first started singing a certain disappointment that the singing generally stopped in May or June, and didn’t resume until the fall. Eventually I discovered that I could cover the time with continued voice lessons, or participation in some of the Seattle area’s excellent sing-alongs during the summer. A couple of summers ago, I decided to step things up and participate in the Midsummer Music Retreat held at Whitman College in Walla Walla, WA. For one week of intense participation, this was great, but the summer still felt kind of empty outside of that experience. Last summer I tried something new in addition to the retreat: a barbershop quartet, practicing most week in the basement of our local church. Great learning opportunity, but without a final concert or other end result, it felt incomplete. This summer, I feel like I finally nailed it. In July, I had the opportunity to take a class on Gregorian Chant and Renaissance Polyphony from Michael Alan Anderson at the Eastman School of Music in Rochester, New York. We spent a week learning about history, notation, musica ficta, and other great topics, then performed a Vespers service and concert on July 26. In August (and in all the summer spare time prior) my new group the Summer Fling Vocal Ensemble kicked off its compressed rehearsal schedule, going from zero to concert in three weeks. We rehearsed a collection of early American music in the context of the American Revolution, and had our inaugural concert on August 27. So, one concert per month throughout the summer. Some great opportunities in both large choral settings and more intimate ensembles. A really unique experience putting together my own concert and ensemble. Feels like going back to regular church and community choir participation will be akin to “taking a break” — and hopefully I’ll be recharged for next summer! We are a mixed chamber group of community chorus singers skipping out for a month during the summer to explore new genres and experience small ensemble singing. The initial idea for the project came about because I have always wanted to participate in a smaller vocal ensemble, with just a few (2–3) voices on each part. In the Seattle area we have an awesome set of community choirs, but most of them are larger than what I was seeking, and the smaller ones were mostly either professional groups or women-only groups. It was clear then that if I wanted the chance to experience and learn in this area, I was going to have to put something together on my own. Last summer (2015), I decided to take my first plunge by assembling a barbershop quartet. I reached out to friends, and friends of friends, and eventually found 3 other people to try it with me. I had no prior barbershop experience, so I had to rely heavily on another member to do most of the driving in what was ostensibly my pet project. It was just the 4 of us with no outside coach or listener to provide feedback. Our work never culminated in any performances, so the end of the project kind of fell flat. I would create a more traditional classical ensemble, where I could at least leverage my own experience. I would hire a coach/conductor to guide some of the rehearsals and provide feedback. I would be sure to end with a concert. 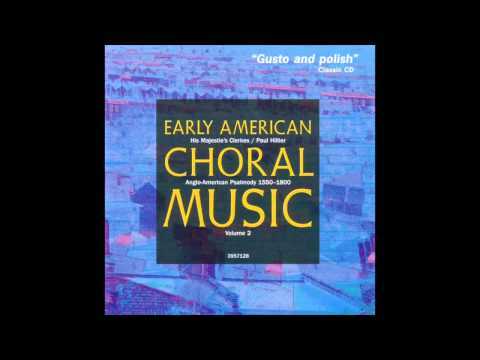 Since I had been recently delving into early American hymnody, and had come across a few interesting anthems along the way, I decided pretty quickly that I would use that as the core repertoire for the group. The next step was finding people. My aim for this group was to find 3 people per part (a total of 12). I really didn’t want to go through auditions, especially since I feel like auditions are not good indicators of how dedicated and hard working people are. So I decided instead to tap my network of friends, and sure enough they came through. It was at that point things began coming together. I whittled down the repertoire to a reasonable, focused program; transcribed all the music from original sources (because I’m like that); arranged mutually amenable rehearsal and concert times; found a coach; located a suitable venue; put together a website and Facebook page; and did the kinds of things I was used to doing as General Manager of the Sacred Music Chorale. However, I didn’t feel like it was really happening until our first get together, which happened last night on July 11. Everyone showed up! We ran through a bunch of the music, I faked my way through directing, and good sounds were made. And now I’m encouraged and very excited to see how this adventure turns out! I’ve recently been researching information about one of my favorite early American hymns, “Evening Hymn,” by Elisha West. It is a gorgeous example of a classic fuging tune, with the haunting period tonality that I just love. You might notice the recording is titled “The Day is Past and Gone,” and not “Evening Hymn.” As with many hymn tunes, the tune is independent of the text, and you will find a lot of mixing and matching going on. Here, the recording is named after the text they chose to set it to. Unfortunately, looking online for a score for “The Day is Past and Gone” by Elisha West turned up nothing (I didn’t know at the time that the tune was called “Evening Hymn”). Even the trusty Choral Public Domain Library (CPDL) came up blank. Or so I thought. They did have a page for Elisha West, and just one score online for a tune called “Our Moments Fly Apace.” Curious, I took a gander and quickly realized that this was in fact the tune I was interested in, just with unexpected text. The CPDL page for this tune indicated that it first appeared in West’s songbook The Musical Concert, released in 1802. Having just recently discovered that scans of many early American songbooks are available online, I did a search and found a version in the Petrucci Music Library (IMSLP). And let them speed their flight. the John Leland text ‘The day is past and gone’ was not published with the tune until its use in Jeremiah Ingalls‘ The Christian Harmony (1805). Hmmm, well, the text matches … somewhat. Verse 3 shown above is missing in the recording, and there are two more verses that aren’t present at all. But if you look closely, it’s not even the same tune! Oh well, so much for that lead. The night of death is near. And leave my soul undrest. The bosom of thy love. A few minor word substitutions in the last two verses. Altering the text in this manner seems to be extremely common. Further research on one of my favorite sites, hymnary.org, reveals that it is both commonly used and commonly altered, with an awesome page that lets you examine all the differences between versions. So, the dilemma: I’m programming this piece and need to pick which text to use. So many options! I could stick with the Watts text and include verses 4 and 5 as well, like the CPDL setting does, but that feels a bit presumptuous. I could follow the recording’s lead and do 4 verses of the John Leland’s text. But it’s weird they dropped the middle verse, and the proper Episcopalian in me hates skipping verses. I could do all 5 verses of the Leland text, but 5 verses might be a bit too much of a good thing in spite of my previous statement. Tough call, but I’m leaning toward the second option (Watts text, verses 3–5). Update: Checking “Our Moments Fly Apace” on hymnary.org reveals an example published in 1848 (without music) called “Boyleston Hymn” that is just verses 3–5 of the Watts text, so there is precedent! Not too much more to report since my last update, except that I am still working on getting comfortable again in my upper range. I’m starting to be able to revisit some of my old solo repertoire and sing it again without too much fear that I won’t be able to hit the high notes. For the Spring season of Seattle Bach Choir I’ve gone back to being a full-time tenor. The repertoire sits pretty high in the tenor voice for this concert (especially for our May Cantata concert), so this has been good exercise for my upper range, with a focus on not pushing myself. I also decided now was the time to go back to voice lessons, so I broke up with my piano teacher and began voice studies again. I’m happy to say that I’m already noticing some good things happening! So I guess this has been a rebuilding year of sorts, but in the end I’m hoping this whole stressful experience will make me a better singer.